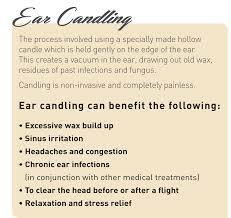 Ear candling is a non-invasive, natural method to clear excess earwax, fungus and infection from the ears and sinuses; and it´s a vital tool in the fight against earache, sinusitis, runny nose, tinnitus, migraine and many stress related conditions. The 30 – 60 minute session is painless, very calming, soothing and relaxing due to the warmth and aroma released. People like it. It’s non-invasive and within fifteen minutes I would say about 50 per cent of people almost fall asleep. lit. As the candle burns, smoke enters the ear canal and melts the ear wax.